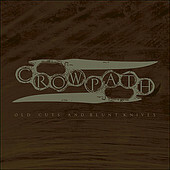 CROWPATH plays a complex and violent breed of post-grind. It is amazing that a band can create a sound so seemingly filled with chaos (bordering on entropy) yet keep it so precise that it creates something akin to a musical razor. For me the neo-grind scene is at its finest when the music is in such turmoil that it's almost pandemonium. The key word being "almost." It's the sense of barely being restrained that offsets the frantic nature of the music and gives it such a heightened sense of excitement. CROWPATH's frantic and ferocious take on aural abuse brings to mind the best of the scene including MORSE CODE HEARTBEAT, HEAD HITS CONCRETE, RED CHORD, and BURNT BY THE SUN. You just knew it had to be on Robotic Empire, didn't you?